On my recent camping trip into Pinetree Lake, in Algonquin Park, I found all kinds of berries and edible plants in the woods around me. 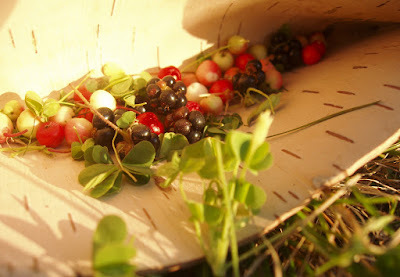 During my walks I would gather handfuls of Wintergreen Berries, Blackberries, Partridge berries, and would nibble on all sorts of plants from the tips of pine needles to Yellow Sorrel (Oxalis). I found a cylinder of birch bark left on the ground, with the wood rotted out on the inside. Birch is an unusual wood. It is better to use green birch wood for fire, because it doesn't season well. It tends to rot very quickly. 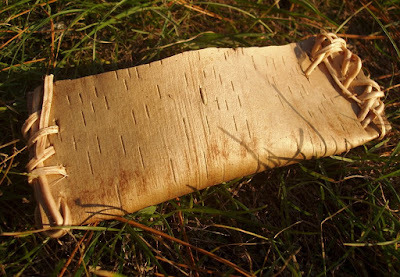 Birch bark doesn't rot at all (hardly...), being full of oil and resistant to fungal growth and insect attack. Some day I'm going to distill a mass of birch bark to produce some of the oil which will waterproof and preserve some outdoor crafts. Using my #510 Carbon Steel Mora I split a piece of dried pine, into a 'break'. 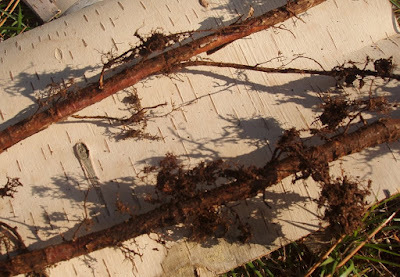 I dug down a couple of inches beneath a tangle of pine trees and extracted a length of root. I used the break to strip off the root bark, and to expose the core. I tried to split it and realized within a minute that the root wasn't splitting evenly, and that the length kept running off to the side. That's when I looked back at the loose soil where I'd extracted the root, and realized that I had inadvertently pulled up some juniper root instead. So I selected another area close by and pulled up a couple of thin pine tree roots. I was extra vigilant this time! Using my break, I quickly stripped the root bark, and exposed the core of the roots. This time the core split evenly, and quickly. This is a very sturdy, flexible material. 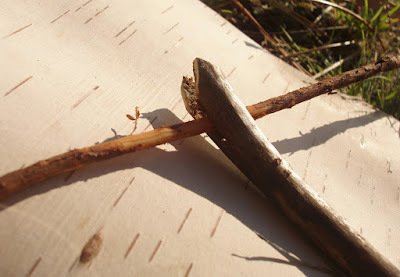 I cut the birch bark into a rectangle. I began to fold it into two, and gently held it over the flames of a quick fire I built. This softened the bark, and permitted it to fold without splitting. I folded it perpendicular to the grain to make extra certain. Gently splitting holes up the sides (not drilling), I quickly laced the roots to secure the edges. Splitting - and not drilling - the holes is important. 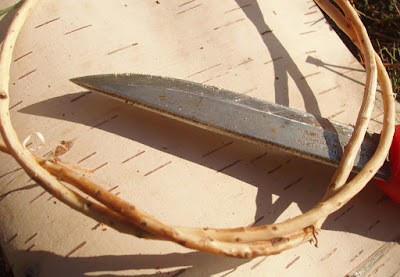 The birch bark self-seals, closing over the splits made with the tip of a knife or an awl (of bone, or fire-hardened wood, or stone, etc...). Drilling holes weakens the fibrous substrate and does not allow the bark to seal over the cordage. If I wanted to water proof it to make a water container or bowl, etc... I could have melted and filtered some pine pitch and strengthened the crystalline / plastic structure of the pitch with finely ground charcoal. But I just wanted it for berries and such. 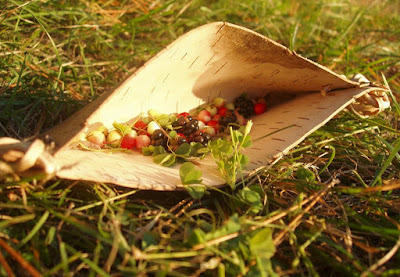 Granted, this was a very primitive container - the least sophisticated kind possible using cordage and a single sheet of bark. Maybe in the coming weeks I'll wander down into the valley and makes something more complicated. But then again, simple can work just fine.